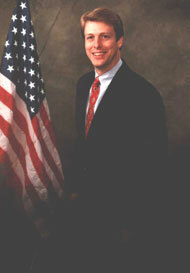 Rep. John W. Rhodes (R) Mecklenburg serves the 98th House District in the North Carolina House of Representatives. He is currently serving his second term in the N.C. House and previously served as a commissioner for the Town of Cornelius and served half a term before the voters of the 98th House district elected him to the State House in 2002. He ran unopposed to win his second term in the North Carolina House. He attended the N.C. Institute of Political Leadership, attended Charlotte - Mecklenburg schools, and The University of North Carolina at Wilmington and is a staunch fiscal and social conservative Republican. His 98th House district includes North Mecklenburg County and the towns of Cornelius, Davidson, and Huntersville. John looks forward to YOUR SUPPORT so he can continue what has begun. Unlike his opponent, who quit after serving only a partial term as a town commissioner, John Rhodes FINISHES WHAT HE STARTS. In the North Carolina House, Rep. Rhodes serves approximately 70,000 citizens in his legislative House District which consists primarily of North and Western Mecklenburg County. Rep. Rhodes has co-sponsored and supported legislation including measures to control state spending and protect local revenue sources and has consistently opposed tax increases against the citizens of our state. For those unfamiliar with John Rhodes they should know his commitment to this community and his state run as deep as his roots here. He and his wife attend Lake Norman Baptist Church. He is a forth generation native of Mecklenburg County, married to Gwendolyn Rhodes whom he met in junior high school where they both grew up in the Mint Hill, N.C. area five miles apart from each other. They have two children and live on a farm in Huntersville, N.C. Attended Charlotte - Mecklenburg Schools. John is active in public service in the region for over 20 years. First, as a dedicated firefighter and medic for Mecklenburg County EMS (MEDIC). This educated him about the grass roots needs of our community. His compassion and dedication to families was honed with every call for rescue he received. Firefighter/Medic 15 years - Mecklenburg County. Mecklenburg County Emergency Medical Services (MEDIC) 8 years. As a small business owner, he has first hand experience with what it takes to found a company and succeed. He is Broker/Owner of Rhodes Realty of Lake Norman in Cornelius where he also resides. John Rhodes is a faithful man, who is not shy about professing his beliefs nor the role they can play in shaping policy. Decency, honesty and integrity are core values which extend beyond his politics into every aspect of his personal life. Lifelong member St. Mark's Lutheran Church, Charlotte, N.C. various leadership roles. "Others may say they are reform, or are conservative, but their actions betray them. My opponent may talk about his ability to get along, but people are wiser than that. When faced with true corruption, we all know you must fight it. Accommodating political influence only brings you into their circle and that is not what I pledged to do. You cannot reform the process unless you are clear and consistent. By holding steadfastly to my beliefs and doing what is right for the citizens I represent, in the end, I know that we will win. Together with my colleagues throughout the government we will EXPOSE CORRUPTION & ENACT REFORM, we can IMPLEMENT A CLEAR REFORM VISION and SECURE for YOU, A TAXPAYER BILL OF RIGHTS." I believe EVERY FAMILY has certain inalienable rights which have been eroded by bureaucratic power. It is TIME TO RETURN true power to the people and allow referendums on important issues. I want your elected officials to HEAR WHAT YOU HAVE TO SAY. And by VOTING FOR RHODES this May 2nd, in overwhelming numbers, we will demonstrate that we are just beginning to fight the good fight."